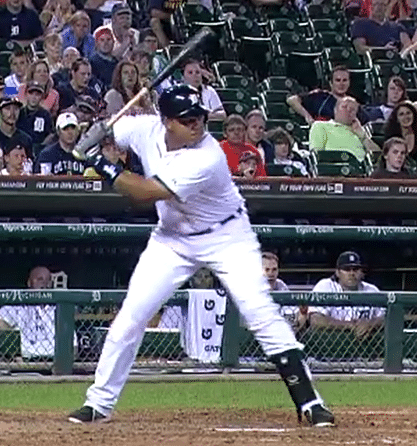 The third installment to the Hitting Backwards: 4 Common Mistakes Hitters Make video series, stars 8-time All-Star & 2-Time AL MVP Miguel Cabrera. I’ll show you how hitting instructors get torque timing wrong, causing reciprocal inhibition to occur in reverse. Why the timing of torque is important. Thanks to Bob Hall from Canada for the subject of this video blog article. Walking Mechanics: Key to Repeatable Power? Land Front Foot Closed OR Open? Big guys like Barry Bonds and Miguel Cabrera land closed (less than 45-degrees). Small guys such as Ryan Braun and Jose Bautista tend to land open (more than 45-degrees). Which way is the right way? NO Separation – If toe, knee, and pelvis are closed after compression signal, then front shoulder has to compensate by flying open the same time as the pelvis. This doesn’t engage our elastic energy systems. Compensation is Inevitable – We find the closed toe in hitters like Barry Bonds and Miguel Cabrera just end up peeling or jumping open anyway at or shortly after contact. So why not get the toe out of the way to begin with? Pitchers Land Open – And also if you look at Olympic Throwers and Shot Putters, they all land open before they throw or “put” their objects. Torque timing in the swing, also known as shoulder-pelvis separation, is often cued wrong. Instructors often yell, “Fire the Hips!” In high level swing mechanics, we find the hips (or pelvis) does fire first. But, the timing coaches cue on is all wrong. Shoulder-pelvis separation occurs before the front heel touches down, NOT after. Really enjoy the information you’re putting out Joey! I’ve recently fallen in love with baseball again after a 20+ year hiatus (brief j.c ball) when my 9 y.o. son began playing. Trying to digest it and put it into play through my son (and admittedly, myself!). Thank you for cutting through the clutter and misinformation. We look forward to forthcoming information. A question: Does the front hip begin to open before toe touch, at toe touch, or at heel plant? Thanks. I did and realize he have discussed this before. But it’s worth discussing it again. I’ve been seeing what you have documented in this article in slow motion video of hitters (ie. Joey Gallo Texas Rangers) (Blaze Jordan amateur hitter Power Showcase ) who have great range of separation in their hips prior to toe touch/heal plant in their swing. This seems to generate a tremendous amount of power. This motion is also extremely hard to emulate without alot of practice. It also leaves a person sore as you are using muscles that are not frequently used in that sequence. It feels like this is not a natural motion for the body and has to be trained by specific repetitive motions. Are there exercises you could recommend to assist in achieving better hip/pelvis separation? David, it’s natural for this movement to feel unnatural to a hitter who doesn’t do it. Just like writing your first and last name in half the letters feels weird initially. But after 10 tries, it’ll take 1/3 the time to write your name in half the letters versus writing your full name. Learning new hitting movements is the same. Mirror drills are the best. Close the eyes facing the mirror like it’s a pitcher, get to landing showing numbers, open eyes, and see if you’re showing two digit numbers.